"Do Chinese Lie?" - The Myth of the "Deceitful Chinaman"
They [the Chinese] are well-behaved, law-abiding, intelligent, economical, and industrious, - they can learn anything and do anything ... they possess and practise an admirable system of ethics, and they are generous, charitable, and fond of good works, - they never forget a favour, they make rich return for any kindness ... they are practical, teachable, and wonderfully gifted with common sense (Sir Robert Hart : The I. G. in Peking: Letters of Robert Hart, Chinese Maritime Customs, 1868-1907 (2 Volumes) , p. 27). These two extremely different generalisations about China symbolize the difficulty of Western observers to make sense of this country. Even today, there are Westerners who extol the virtues of Chinese society and ethics, while others blacken and stigmatize them. As a foreigner, one is always confronted with traits of the host culture which appear shocking or hard to comprehend. As I have explained in my post about culture shock, the ways in which individuals react and adapt themselves to the life in a foreign country are manifold. Some people cannot cope with the challenge of adjusting themselves to a new environment and may develop a resentment towards the host culture. Others integrate themselves more or less smoothly. This is a problem that, as far as I have experienced, affects expatriates in general, regardless of where they come from. When I lived in Germany, I saw many Chinese, Koreans and people from other countries who did not feel comfortable in the new environment. For example, many Koreans, who are accustomed to a social order where etiquette, age, hierarchy etc. are important for the individual, find it hard to get used to a society that is based upon different values, where what they've learned to be just and right causes them to be scorned or derided, rather than praised. I remember when a Korean friend of mine once bowed to a professor as a sign of respect; in Germany, this is considered excessive, to say the least. He wanted to honour his professor as he had learned to do in his home country. He believed to be behaving properly, and yet he was met with ridicule by the other students, who giggled mockingly. Some expats who experience such situations may eventually mature a deep-seated hostility towards the host culture. They feel wronged and misunderstood by others and wish to go back to a social context where things are clear and predictable to them. The myth of the 'deceitful Chinaman' developed in a somewhat similar way. In the past as in the present, Western people who live in China are confronted with behaviours that surprise them, offend them, even repulse them. Of course, not all expatriates have the same point of view. As the two aforementioned quotations show, the way in which people react to and interpret a new culture can be very different. What is true, however, is that a large number of Western people who lived in China over the last two hundred years seem to have noticed some deep difference in the way in which Chinese people communicate and relate themselves to others. The various attempts to explain such differences have ultimately given rise to a myth that is reflected in the astonishingly simplistic entry of the Encyclopedia Britannica of 1842. 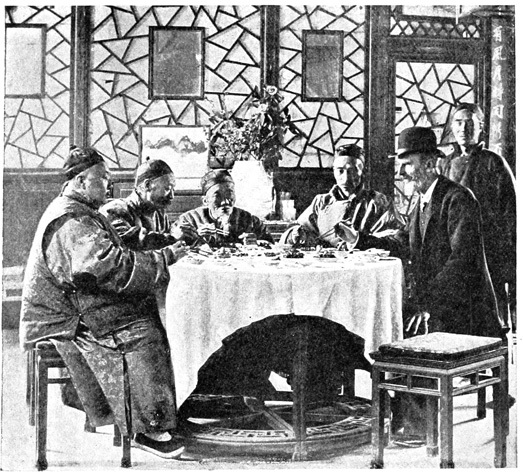 The idea that the Chinese are not honest was first expressed in modern times by Western people who lived in China in the 19th century. They obviously set their own cultural values as the standard, and therefore interpreted their host culture in a negative way. In retrospect, I would see this as a particular form of culture shock, not entirely different from the one people may experience nowadays when they live abroad. Due to the geopolitical conditions of the 19th and first half of the 20th century, however, such culture shock became harmful, because it prompted Western people to condemn and try to change their host culture. An Englishman ... prides himself upon being straightforward and of saying exactly what he believes. A Chinaman would never dream of taking that position, simply because it is one that he does not understand, and consequently he could never carry out. A straight line is something that his mind recoils from, and when he desires to effect some purpose that he has before him, he prefers an oblique and winding path by which in a more roundabout manner he hopes to attain his end. It may be laid down as a general and axiomatic truth, that it is impossible from hearing what a Chinaman says to be quite certain of what he actually means (Rev. J. MacGowan : Sidelights on Chinese Life, Chapter I). Such understanding of Chinese communication strategies has evolved, becoming somewhat more gentle. But the idea that the Chinese are less direct, and in some respects deceitful, has remained. For example, books about doing business in China often emphasize the different concept of 'truth' in Chinese thought. Westerners are more direct and therefore more willing to get to the truth at the expense of courtesy. Chinese, on the other hand, are more likely to favor courtesy and face-saving at the expense of truth. Western leaders are frustrated in China by the focus on courtesy over truth. Likewise, Chinese leaders are often frustrated by the expectations of foreign employees and their foreign headquarters to know quickly what is happening, regardless of the impact on "face" (Frank T. Gallo : Business leadership, p. 99). One cold winter weekend I had taken the train from Nanjing (where I was teaching English to teachers) to the famous tourist city of Suzhou, renowned for its gardens, beautiful women, and gentle dialect. At the hotel counter I set out to book a room. A group of foreign students walked by and said they had just gotten beds in the "dormitory" for ten yuan a night. I went up and said I wanted a bed in the dormitory. "We don't have a dormitory." This had to be a "lie," because one minute earlier the same clerk had assigned the other students to the dormitory. "Yes there is; they got one." "Oh, well, there aren't any more beds." "They said it was empty." "Well, foreign teachers can't stay in the dormitory." "Why not? That doesn't make sense." To an American, anyway. "You wouldn't be comfortable. There is no private bathroom and you have to share the room... You would not be comfortable." "I would. I'm younger than they are. I would be fine. I don't care about the bathroom..."
Ultimately, it was much more trouble to have me standing there arguing than to risk having me complain about the lack of comfort, so I "won". I slept in a bed for ten yuan a night with other foreigners and walked down the cold hallway to the bathroom... [T]here were many motivations behind this clerk's giving the answer she did, and "telling the truth" was one that was weighed rather lightly relative to other goals (Susan Debra Blum : Lies That Bind - Chinese Truth, Other Truths, p. 26). As Susan Blum explains, the motives behind the clerk's vagueness are hard to make out. Perhaps her boss had told her that professors shouldn't sleep in the dormitory. Or perhaps she was truly caring about the guest's comfort. Ultimately, the "why" of ambiguous statements cannot always be guessed. As I will explain in another post, this is exactly what makes this communication strategy so attractive and instrumental. Westerners are hindered in dealing effectively with face-saving behaviors because they value directness in most ordinary social situations. They prefer to state matters (as they understand them) in a straightforward and accurate manner. Westerners say "No" when their self-interest dictates that a negative reply is the necessary response. Westerners say "I don't know" when, in fact, they don't know ... They occasionally tell white lies, but, more often, they tell it like it is even when they know that a straightforward, truthful response will not be emotionally pleasing to the other person. Westerners assume that each person is better able to advance his or her self-interest when the situation at hand is thoroughly understood by means of direct verbal communication (Hu/ Grove / Grove : Encountering the Chinese, p. 106). in accordance with external expectations or social norms, rather than internal wishes or personal integrity, so that he would be able to protect his [or her] social self and function as an integral part of the social network. [This behaviour includes] a predisposition toward such behavior patterns as social conformity, nonoffensive strategy, submission to social expectations, and worry about external opinions in an attempt to achieve [one's purposes] (ibid. p. 109). In principle I agree with these statements, but, as I will explain later, I would de-emphasize the importance of submission and face-saving, and rather underscore the role of China's peculiar social structure. I would also avoid explaining the different communication strategy as an exclusively 'West-East' issue. Defining the Chinese collectively as deceitful is certainly an exaggeration, and a very dangerous one. However, the fact that many Chinese and East Asians in general use language in a way that may be unusual to Westerners seems to have some truth to it. I have been myself often confronted with situations in which I expected a straightforward and direct approach, and yet others spoke vaguely and ambiguously. However, there were other situations in which Chinese or Taiwanese were much more direct than I would be. In the next post, I will try to explain this particular phenomenon by examining some characteristics of Chinese society and their impact on the way people communicate and relate themselves to one another.